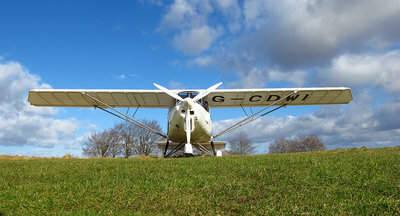 The Extended Flying Experience, at £199, is suitable for someone who has never flown before, and an 80-minute flight offers loads of "hands-on" time. Perhaps you want to give us a try before deciding to learn to fly, or maybe it is pure indulgence, as it was for one lady who had dreamt of flying over Tinto Hill! Whatever, our aim is an experience to treasure! Usually we will fly across country to another airfield, perhaps visiting Cumbernauld Airport or the private landing strips at Carluke or Crawfordjohn. with you in the left-hand seat: the "captain's" seat of our dual control aircraft. Our aim is an experience to treasure!